Items marked Ship FREE! Most Items Ship Same Day! Availability: Out of Stock Notify Me When They're Back! 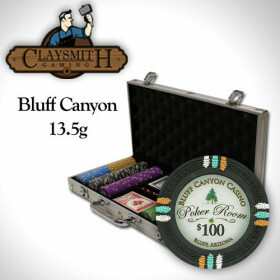 This high quality Bluff canyon poker chip set features a custom Claysmith Gaming aluminum case that holds up to 300 chips and includes removable trays. 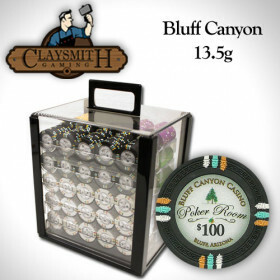 300 Claysmith Bluff Canyon clay composite poker chips. You also receive a deck of playing cards and a free dealer button. Now we're talking serious chips! 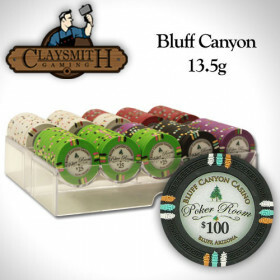 The Claysmith Bluff Canyon 13.5 gram clay poker chips are the real deal. These fantastic looking chips have twelve stripes for their edge markings and are made from Claymith's incredible Greek Key molded poker chip. This chip mold includes a series of engraved impressions, or mold marks, around the surface of the chips that make them stand out from the crowd. This intricate mold design, along with the unique edge mark design make these chips some of the most popular chips we carry. Note: Your set may not include all denominations shown. 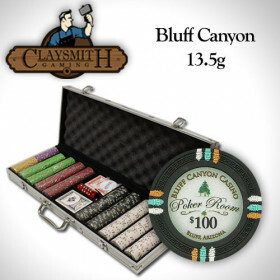 The Bluff canyon inlay design is patterned after the very popular Venetian Poker Room casino chip. 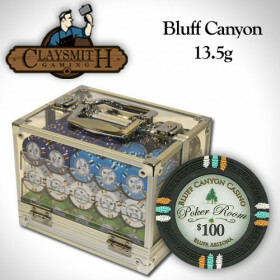 This design includes a truly rugged look with a small grove of evergreen trees and the fictitious Bluff Canyon Casino marked across the top. The large denomination is placed near the bottom of the chip. It's quite easy to see why these poker chips are so popular. 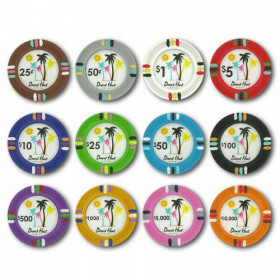 They have the look and feel of true casino quality poker chips and stand out from the crowd of generic chips on the market for the home casino enthusiast. 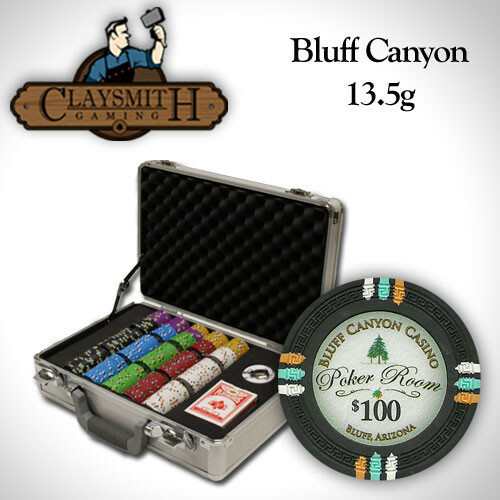 Learn more about the high quality of Claysmith Gaming Poker Chips. Step up to a set of high quality clay composite poker chips today and take your game to the next level! 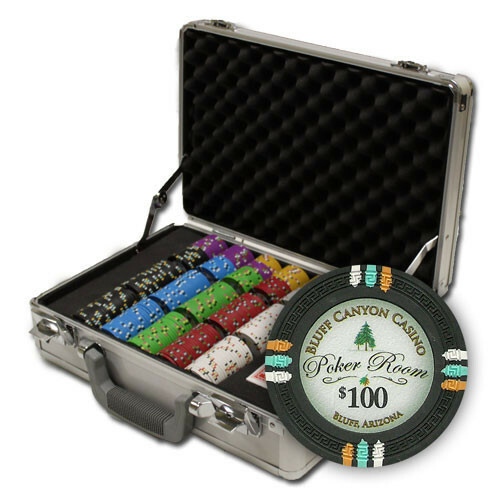 Protect your poker chip investment in style with this custom designed 300pc poker chip case from Claysmith Gaming. The case is made from a high grade aluminum with a smooth exterior surface and the aluminum plates are thicker than most stock chip cases. You can feel the quality in this case. The corners are reinforced for extra durability and the handle is made from high grade rubber to make transporting your chips easy. 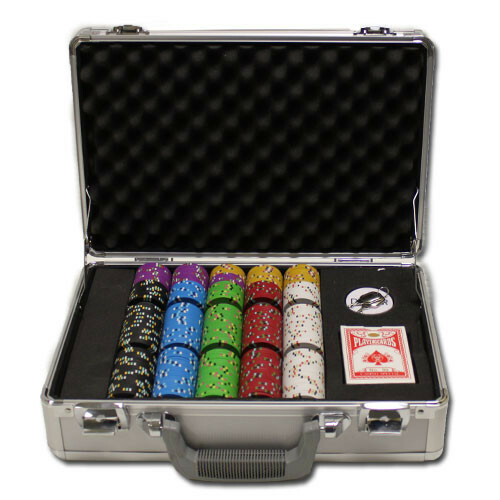 The clasps are extra heavy to ensure the case remains closed tight and keeps your chips secure during transport. It also comes with a pair of keys for keeping your chips locked up. This case measures 14.5 x 20 x 4.5 on the outside. 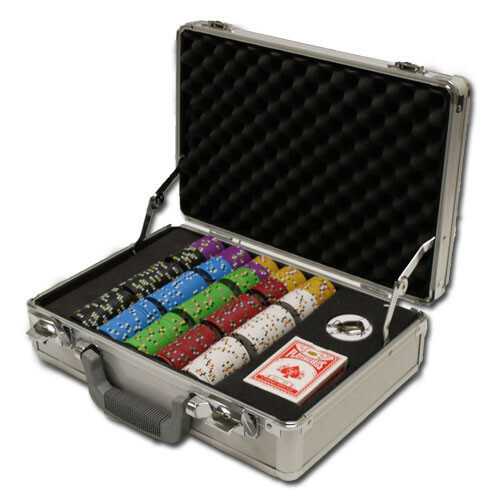 The interior is lined with high density foam that keeps your chips and accessories in place, and includes 3 removable acrylic chip trays that hold 100 chips each. These trays are perfect for organizing your chips at the table, or use it for a bank. Buy a Claysmith case and give yourself the peace of mind that you can only get with quality supplies. The price on this set includes the standard pre-packaged chip breakout listed above. 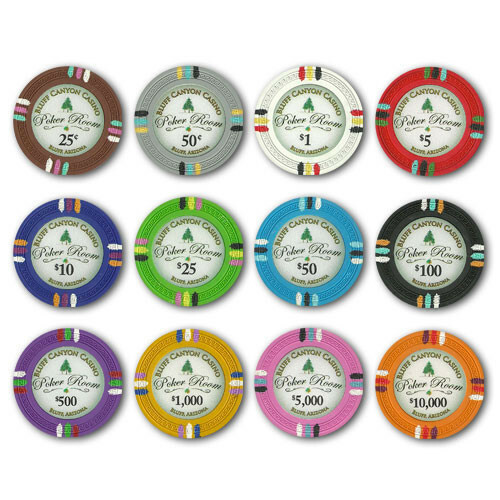 We are able to offer customization of the chip denominations/colors if you want, for an additional $7.50. If you want to customize the set, please contact us before placing your order.